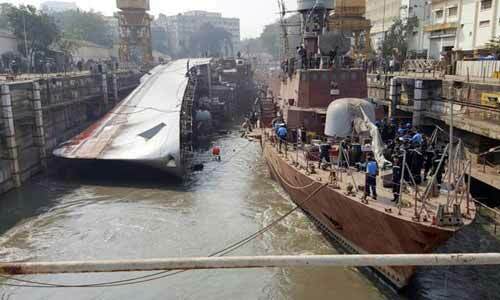 The Navy has begun the process of restoring guided missile frigate INS Betwa that tipped over while it was being undocked at the Naval Dockyard in Mumbai early this month. Two people were killed and 14 injured in the incident. Three international specialist firms are at present assisting the Navy in the preliminary work. “The task is to make the ship upright. As of now it is 25 per cent in water. Specialist teams are assessing as to how much of it is buoyant and how much is resting. All three firms are doing consultancy work. Final contract to one of them will be given in early January after which actual work will begin. All tasks will be undertaken by the Navy,” a source said on Tuesday. The 4,000 tonne frigate was undergoing a scheduled two-year medium refit, which started on April 15. It is one of the three Brahmaputra class ships and was commissioned in 2004. The hull was being prepared for which the ship went into dry dock on October 20. The accident occurred when it was being undocked due to which the mast of the ship hit the ground on the left side. Sources explained that the immediate task is to put blocks under it to prevent structural damage to the ship. After that controlled de-flooding of the dock as well as the ship will be undertaken and the ship would be made airtight. Once the ship is secured, Pneumatic Fenders, which are huge balloons, will be placed under the side and inflated to set the ship upright, officials said. “Work is going on 24x7 on war footing. It will take time,” sources added.